Alton District Sports Council have launched a campaign against East Hampshire District Council plans to replace the existing Sports Centre with a Leisure Centre rather than a dedicated Sports Centre. The new facility will be smaller than the Current building and the design seems to have been carried through EHDC procedures with little or no consultation with either Alton Town Council or Parish Councils whose constituents are likely to use the new facilities and, despite the dramatic increase in potential users in the area since the original Sports Centre was constructed, the new centre is smaller and has reduced the availability for sporting activities to shift the emphasis to a spa and leisure based activities. The company appointed by EHDC to oversee construction and manage the new facility is Sports and Leisure Management Limited, who manage around 140 centres around the country under their consumer brand name 'Everyone Active'. They have a wealth of experience in running this type of operation and will no doubt have been appointed after a well established negotiation procedure with EHDC. The major cause for concern among users of the existing sports centre and local councils was highlighted at the Farringdon Village meeting in April when, in a somewhat evasive answer to a question from Farringdon Parish Council Chairman Clive Elderton, our local East Hampshire District Council representative, Tony Costigan, gave the impression that the EHDC had negotiated a fixed price contract with 'Everyone Active' to build and manage the new centre before any discussion with local interested parties regarding the facilities included and the design and layout of the new facility. Councillor Costigan also seemed to suggest that the plans for the Sports/Leisure were still open to negotiation after the criticism of the proposed facilities were raised by Alton District Sports Association, users of the current sports centre and local councillors. Now quite how any major design or internal changes can be made after a firm has signed a fixed price contract is something of a mystery, but if you want to clarify the matter Councillor Costigan's contact details can be found on the Parish Page. You may have received the flyer concerning the New Centre through your letterbox which also mentions a survey in which you can express your views on the new facilities. 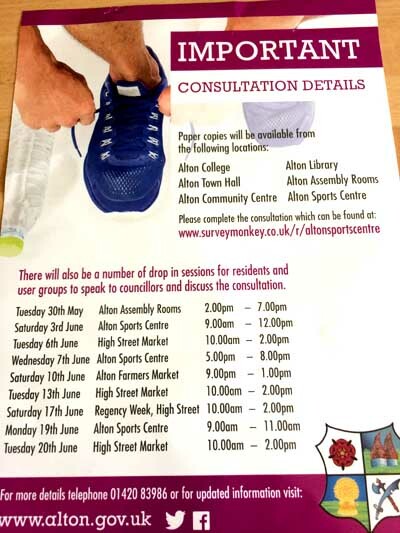 Fore more details telephone: 01420 83986 or go to the Alton Web site or more visit one of the drop-in sessions listed on the leaflet , further copies of which can be obtained from Alton Sports Centre, College, Town Hall, Community Centre, Library or the Assembly Rooms.